This is a problem that generally affects older properties, either through the failure of the existing damp proof course or simply because the structure pre dates its inclusion. We have over 50 years experience in dealing with this problem and when damp proofing, we use the very latest Gell products injected into the mortar joints which are virtually odour less and environmentally friendly. We employ trained surveyors to accurately assess the problem and provide a detailed report with associated costs. The work is carried out using our own specialist staff followed by our plasterers and carpenters where applicable. 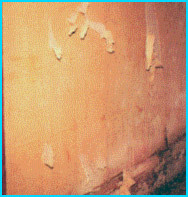 Dampco are expert at ending what, on the surface of things looks very unsightly but, what is more important, is also causing structural deterioration at ground floor level. Dampco have the complete solution in the form of a specially prepared chemical that is injected into the pores of the brickwork and the surrounding mortar joints as shown. 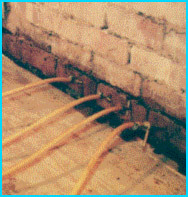 Thus the prime cause of rising damp is neatly and effectively contained, guaranteed. Survey Reports and Quotations. Every visit is followed up with a comprehensive survey detailing any defects found and the recommended methods of treatment. In this way you are left in no doubt as to what needs to be done to solve your problem. The survey is accompanied by a comprehensive quotation providing a clear, step-by-step plan of campaign stating the cost of each step involved. On your acceptance, work is carried out by our own fully trained staff to every exacting standard.